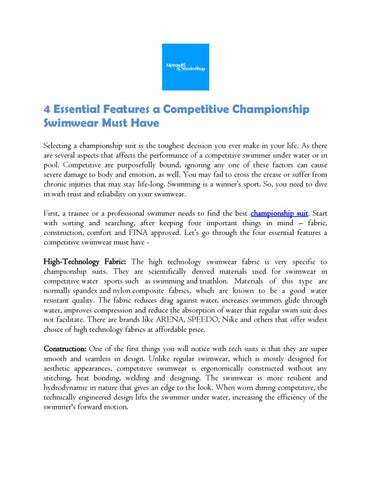 4 Essential Features a Competitive Championship Swimwear Must Have Selecting a championship suit is the toughest decision you ever make in your life. As there are several aspects that affects the performance of a competitive swimmer under water or in pool. Competitive are purposefully bound, ignoring any one of these factors can cause severe damage to body and emotion, as well. You may fail to cross the crease or suffer from chronic injuries that may stay life-long. Swimming is a winner’s sport. So, you need to dive in with trust and reliability on your swimwear. First, a trainee or a professional swimmer needs to find the best championship suit. Start with sorting and searching, after keeping four important things in mind – fabric, construction, comfort and FINA approved. Let’s go through the four essential features a competitive swimwear must have High-Technology Fabric: The high technology swimwear fabric is very specific to championship suits. They are scientifically derived materials used for swimwear in competitive water sports such as swimming and triathlon. Materials of this type are normally spandex and nylon composite fabrics, which are known to be a good water resistant quality. The fabric reduces drag against water, increases swimmers glide through water, improves compression and reduce the absorption of water that regular swim suit does not facilitate. There are brands like ARENA, SPEEDO, Nike and others that offer widest choice of high technology fabrics at affordable price. Construction: One of the first things you will notice with tech suits is that they are super smooth and seamless in design. Unlike regular swimwear, which is mostly designed for aesthetic appearances, competitive swimwear is ergonomically constructed without any stitching, heat bonding, welding and designing. The swimwear is more resilient and hydrodynamic in nature that gives an edge to the look. When worn during competitive, the technically engineered design lifts the swimmer under water, increasing the efficiency of the swimmer's forward motion.